First impressions count, especially when it comes to the entrance of your home. They not only affect a buyer’s decision when you’re trying to sell your home, but give passers by an idea of what lies within your four walls. They also have a part to play in keeping your home secure and saving you money on heating, so choosing the right front door is a decision that should be well researched and carefully considered. The best front door for a town house can be completely different to the right solution for a cottage in the countryside, so we’ve pulled a mini-guide to help you make the right decision and create a statement entrance to your home. Townhouses are renowned for their period characteristics from the Georgian, Victorian and Edwardian eras such as decorative fireplaces and classical tiling. If the interior of your home boasts any of these period features then it’s important that your exterior does too. Timber doors with fanlights above are a typical feature on a lot of suburban period homes and can look stunning with handmade coloured and leaded units incorporated. Solid panelled doors without glazing should be dressed with stunning hand-made furniture such as a ring knocker and an octagonal door knob to give a look of grandeur to the front of your property and create a focal point for visitors. When you think of a cottage you immediately picture a small, cosy house in the countryside with white picket fences and smoking chimney pots. This is often, but not always the case as these old family homes have been extended over the years to become more accommodating for modern day living. The front door of a cottage can take on many forms, some will be partially glazed to let light flood into the property, and others will be entirely solid with no glass at all. One common feature found on most traditional cottage doors is vertical timber panelling. This style of door originates from ledge and brace framed methods that are notorious for twisting and warping as well as being very bad at keeping the elements out. 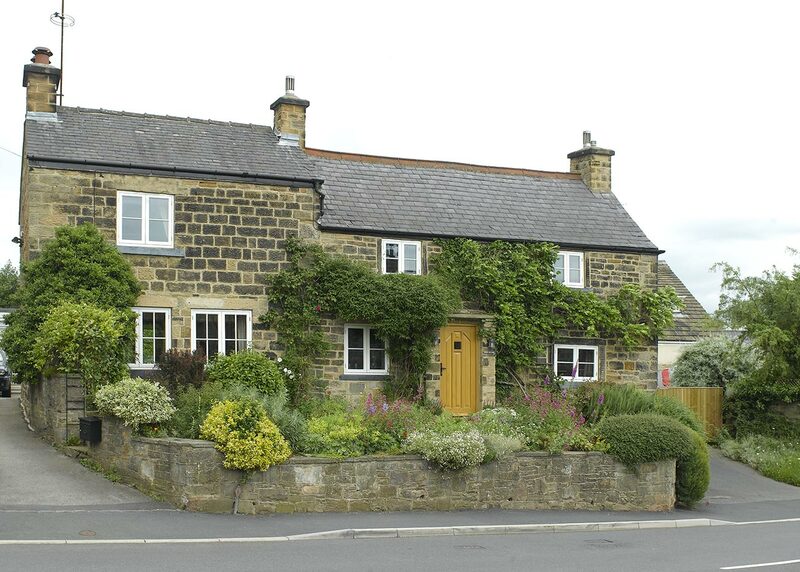 Our cottage inspired range of doors are fully insulated and weather-tight, the engineered timber combats movement synonymous with this style of door meaning you can have the look without the problems. Olde-worlde ironmongery and strong Heritage colours will set your cottage apart from your neighbours. Deep blue looks stunning against light stone walls, whilst a muted green brings your spring blooms to life. Just like farmhouses, no two barn conversions are the same. Each one has their own, unique characteristic, and the story behind them should start with the front door. They’re well known for large open spaces and bright, airy rooms, so a popular choice for the entrance way is a front door with full height glazed sidelights. These not only stream more natural light into your home, but add something special to the exterior, especially if you choose to include bespoke sand-blasted designs within the glass. Barn arches can often make the property feel like a goldfish bowl if done wrong. Opt for low level raised and fielded panels to break up the expanse of glass and include a decorative glazing bar at the top of the glass to draw the eye away from the inside and toward your beautiful front door. Dark and light oak finishes look at home in any barn conversion, and even more special on our contemporary range of entrance doors. Our Ebrenn and Dowr doors, with their clean, horizontal stripes, sit beautifully with the historic pale stone of a barn. Stainless steel furniture is a must to complete the contemporary look. If you’re looking to give your barn an altogether more traditional feel then you should consider a stable door; they work brilliantly with barn conversion living and can be opened at the top to allow a flow of air through the house whilst preventing children and animals escaping (or entering in some cases). Often passed down through generations, farmhouses are filled with memories, from family celebrations to commiserations. They each have a history with a different story to tell, and every nook and cranny has a part to play in that tale. The front door is one feature that is a big part of it all, and a popular choice for farmhouses is a vertical panelled door like our Staverton design which includes a small square of glass at eye level for peeking at visitors. No farmhouse would be complete without a stable door. Not only are they pleasing to the eye of both you and those walking by, but are highly practical too. With two separate openings, you can enjoy your surrounding countryside, without having the worry that your youngest family members will wander afar.